Why would anyone apply advanced nano-science to the color of your car? There are a number of good reasons to do so, when you think about it. High-tech dyes could offer improved protection against fading, and preserve colors for longer. In addition, some colorants are metal oxides, which can be toxic to those who produce and work with these materials. Nanotechnology-generated dyes, on the other hand, do not necessarily require these ingredients. In fact, they can be designed so as to mimic natural pigments as much as possible. Natural ‘colors’ are expressed onto surfaces such as skin, hair or feathers in such a conformation that they appear to emit the appropriate color in response to how the light hits them. This means that an animal’s ‘color’ is determined largely by the refractive index of the pigment molecules it produces. These observations inspired a team of bioengineers to develop a nano-pigment based on molecules that also emit specific colors according to how they self-assemble and how densely they pack together. Moreover, these molecules are those of melanin, the pigment compound that determines the color of human skin. 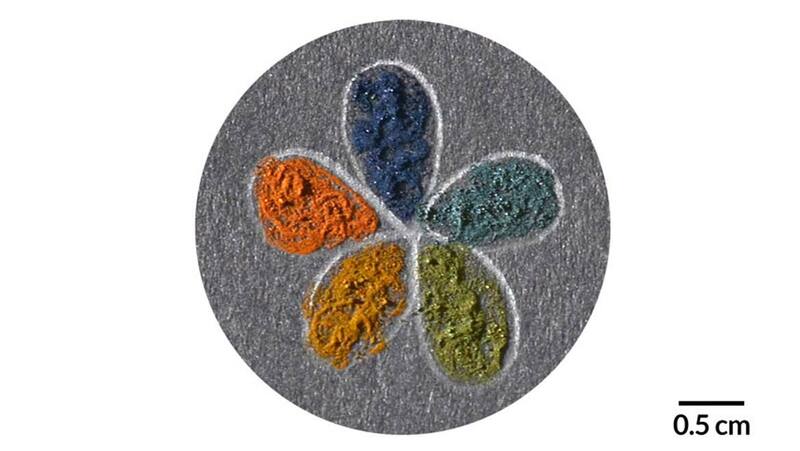 Nanotechnology applied to this industry is not truly a brand-new discipline; its end-products, known as ‘structural colors’, are an emerging trend in synthetic pigment production. They can improve on traditional dyes, which are based on some organic molecules or metal oxides, particularly in terms of fading. On the other hand, structural colors have not afforded quite the spectrum of colors expected by modern consumers and manufacturers to date. Structural colors offer shades through light refraction, rather than absorption as conventional dyes do. Therefore, some nano-dyes can be iridescent, or appear to change colors at least slightly when they are turned through different angles. Some groups have tried to address this with light-absorbing additives, including gold nanoparticles, carbon-black or pyrrole, but this strategy can result in reduced saturation. Given that some customers are complaining about the muted colors on their new, €1000 Pixel 2 XL phones, you can see why this isn’t a desirable property in a commercial pigment. A team collaborating across several polymer technologies, chemical engineering, chemistry, biochemistry and nanotechnology centers in the U.S., China and Belgium decided to try a new tactic: nano-spheres of pigments with a high refractive index (RI; to manage iridescence) coated in a silica outer shell. This outer layer had an RI similar to water; this was likely to improve the visibility and longevity of the desired color, and for added pigment durability. The color-nanoparticles were made of a synthetic melanin, which the team aimed to ‘arrange’ to match the conformations of natural pigments as found in bird feathers. This background allowed them to develop shelled nano-spheres in which the space between the melanin cores could be varied to give different colors through optimal RI values for each respective shade. This was achieved by modulating the thickness of the outer shell to increase or decrease the space between each core. The melanin core’s thickness was maintained at 160nm per sphere. Next, the team had to find a way to suspend the nano-spheres in a way that would induce them to self-assemble into usable ‘supraballs’, or usable micrometric superstructures. This was done by placing the nano-spheres in water, and introducing 1-octanol into this solution. This oil-like alcohol induced supraball formation by causing the gradual removal of water from the nano-spheres. The team then had visible forms of the nanoparticles that they could assess for color formation and possible changes in this. This supraball-production process has a number of advantages, particularly as it did not require the use of any external energy source, and only requires a centrifugation step to isolate the supraballs. In addition, the process did not require a surfactant, despite being a variation on emulsifying techniques. The team found that supraballs consisting of nano-spheres without an outer shell, so with the 160nm melanin cores alone, appeared black. However, supraballs made of spheres with 36nm or 66nm outer shells showed pronounced olive-green and red shades respectively. Spheres of pure silica produced supraballs of a very pale cyan color, as may have been expected of a material with its RI and uneven light-scattering abilities. However, all supraballs with melanin showed an appreciable reduction in incoherent light scattering (which is responsible for iridescence) and an ability to display saturated colors. Further experiments that involved studying and varying the microscopic structure of supraballs and how this was affected by mixing nano-spheres of differing shell thicknesses resulted in five distinct pigments: the olive and red as above, as well as a dark navy-blue, light blue and a dark yellow. However, the team, writing in their paper published in Science Advances, claim that the supraballs can be tuned to produce any color represented by the visual light spectrum. This team of bioengineers across the world have shown that science can produce synthetic pigments that behave like those that arise as a result of the arrangement of melanosomes, the natural supraballs found in nature. The structural colors that may result from this study could well be incorporated into a number of applications and materials, including long-lasting inks, paints, cosmetics and coatings. They retain their intended color regardless of the angle at which they are viewed, and should be extremely durable thanks to their components. The supraballs of which the macroscopic colors are made are also relatively simple to produce, requiring few steps and few other raw materials. These nature-inspired nano-pigments may be coming to a surface near you soon. Xiao M, Hu Z, Wang Z, Li Y, Tormo AD, Le Thomas N, et al. (2017) Bioinspired bright noniridescent photonic melanin supraballs. Science Advances. 3:(9).